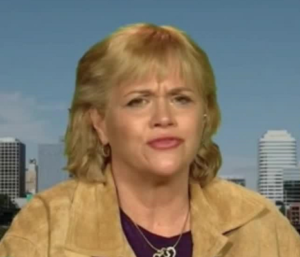 Samantha Markle, half sister to Meghan, is back grabbing for her sliver of fame by rubbishing a recent magazine piece in which friends of the Duchess tried to counter recent negative media coverage. The griping and clearly resentful Samantha was born in November 1964 and in a recent interview said she’d spent Nov 22nd Thanksgiving and her birthday with her father and I’m informed it is in fact November 24th. That would make her a Sagittarius Sun square Saturn in Aquarius on one side and square Mars in Virgo on the other. Hard Saturn aspects will dent her self-esteem and in Aquarius can be cold and domineering. Sun square Mars is impulsive and competitive. She’ll have her head in the clouds with perhaps delusions of grandeur from Jupiter in indulgent Taurus opposition Neptune. With Jupiter in see-saw square to Saturn and Neptune in a neurotic square on the other side. Most significantly it gives her a Mars, Uranus, Pluto in Virgo triple conjunction which is extremely volatile, with major anger issues. Mercury in outspoken Sagittarius is in an intense, contemptuous and unpredictable square to Pluto and Uranus. 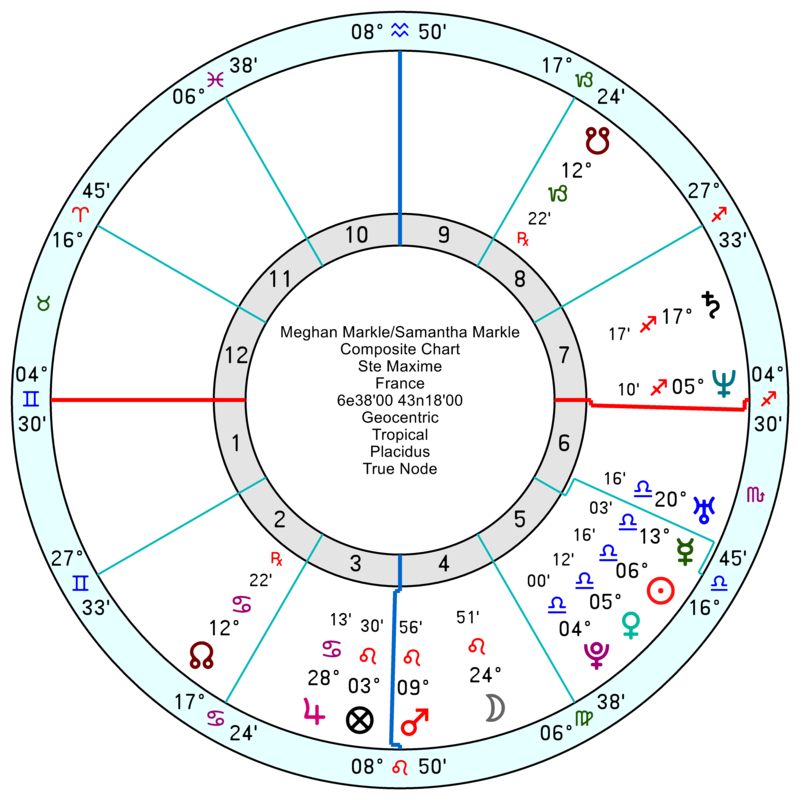 She also has flamboyant, attention-seeking Moon to match Meghan’s Leo Sun. Both of them aspire to a five star lifestyle. 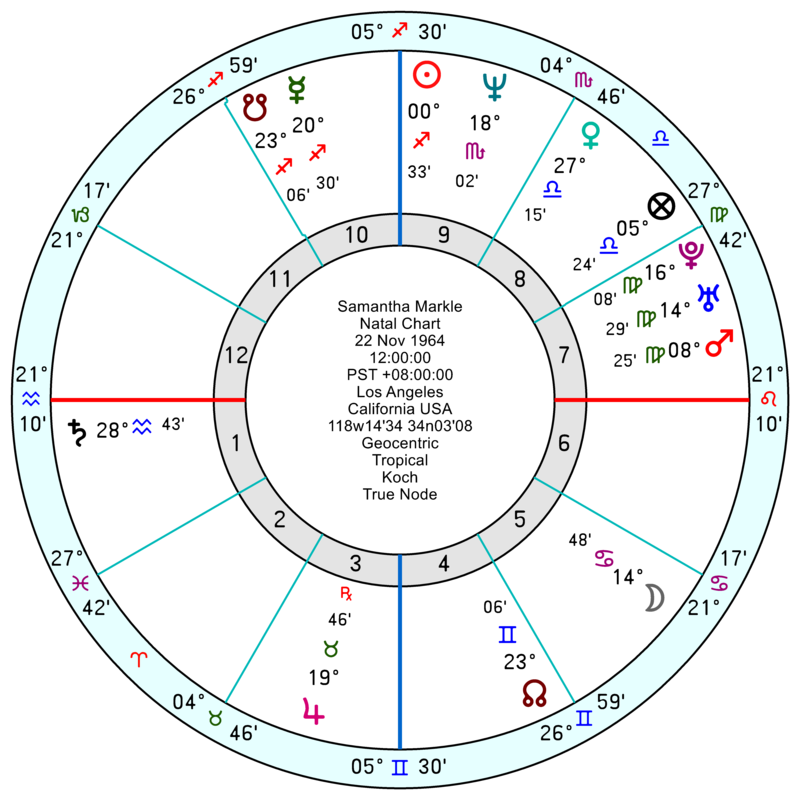 Samantha’s Sun is also conjunct Meghan’s Uranus so not great for sharing the same space; and Samantha’s Saturn squares Meghan’s Uranus so she’d constantly be trying to curb her freedom. 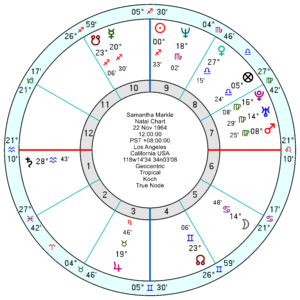 The relationship chart has a tightly bound together composite Sun, Pluto, Venus on the focal point of Mars trine Neptune. Pluto makes for control and possessiveness; Mars Neptune for a mutually unsupportive interface – only one can win. Mars Pluto is hostile; and the composite Mars is also trine Saturn which is dislike and irritability. 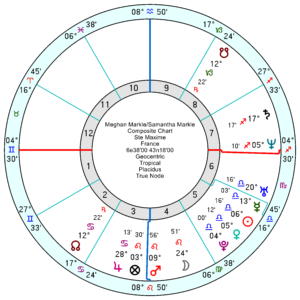 Like the relationship between Meghan and her father, it looks like trailing on unhappily through this year with this April being a sore point; and is even more unsettled in 2020. Envy is a deeply unpleasant emotion. ‘I’m not happy and feel my life is lacking so I’m going to try to destroy another person’s happiness to make me feel better.’ Contemptible. I have no sisters, but I can relate to Samantha on several levels. In a 1990s interview, Samantha, also a model and actress, said she would be miserable in an office job. I am exactly the same way, and I am also an actress as well as a writer. Since early childhood, I’ve been an intense anti-monarchist. While I believe in egalitarianism, deep down, I feel if I can’t be a princess, then no one can. And as a protest, I have given myself an HRH title and advocated that everyone do the same, which would make all of us royal. Yes, I am a fame whore desperate for attention who gets a high just from being on stage or camera or walking in a procession during a Renaissance fair. Seeing someone like Kate Middleton get so much undeserved attention literally makes me ache. Inequality breeds this sort of thing, and I feel it is overly judgmental to blame someone like me for being so allergic to it. Would you consider me evil and contemptible? My DOB is 7/10/1965 at 3:58 am in Jersey City, NJ. I do have some sympathy for Samantha and her father. Meghan really could have dealt with her family situation better. After all, she is famous for joining the Royal Family. Even Meghan’s father said that if Meghan had shown some ‘kindness’ during the approach to the wedding, ( I think he meant acknowledgement for her sister & himself), a lot the angsty family psycho-drama could have been minmized. Did Meghan not realise that joining the BRF would inevitably put the spotlight on her own family, whether she liked it or not? So odd to believe that her family could be erased to the point that these people almost never existed, according to Meghan, just as she was joining the most famous family in the world! Her stance is almost baffling and seems to have caused a certain degree of self-inflicted harm. No excuses for the media bullying. Any data for Thomas Senior? I don’t think we ought to grudge Samantha on her jealousy. Having a newly appointed ‘Princess’ as a sister would be tough for most mortals to contend with. Wouldn’t anyone, bar the super confident wither inside a little? Interesting that Meghan possesses a simian line on her palm, along with Tony Blair, Hillary Clinton and Robert de Niro, to name a few. These people are often classed as being intense and rather driven personalities, so maybe not everyone’s cup of tea. Honestly, no. Especially not at my age. I think my feelings would be a mix of pride and concern. And I also have an out of sign Sun/Saturn square. I can only imagine there might be more of those feelings if I was young and my sister was very close in age. But no, I can’t relate. Ah, yes, so we downplay the astrology and play up her entitlement to be jealous because of a royal sister. No sympathy from this section of the bleachers. Tearing down her sister’s life will lead to nothing good. I would enjoy following you. I’ve been studying astrology (intensely) since Neptune contacted my natal Jupiter. Here is my birth data if you wish to see it. Jan 19, 1960. 11:52 pm. Long Beach, Ca. I would like to see yours! You’re welcome! I look forward to your update. Your analyses are spot on. I guess for me the important part is whether or not the info is true. And I’d much rather see the talons than have a knife stabbed in my back. But I’m a Taurus; we’re pretty blunt. Much better social skills to be employed than bluntness. I think she’s awful. She was Samantha Grant until her sister was engaged and she decided to change it to Samantha Markle; she who accuses her sister of opportunism! She’s estranged from her own mother too, so double standards. A hateful, vicious piece of work. I too am alarmed at the hate slung at MM in the UK popular press, especially their need to endlessly pit Kate and Meghan against each other. It’s predictable, relentless and totally depressing. I find all the venom directed at Meghan Markle very disturbing. I disagree. I think Samantha is in her right to say what she has. And honestly, there’s probably a lot of truth in what she says about Meghan. People simply want to believe in the princess fairytale so they’re ignoring anything negative that comes out about Meghan. Oh well, time will reveal everything. On a less contentious note, Sam’s birthday is Nov 24th and Thomas Jr.’s DOB is 09/17/1966. Thanks for the dates. Will amend. It’s not so much a question of believing in the princess fairytale as disliking raw envy slashing out its talons. It’s unpleasant to watch. Ah well, only the best princesses have pantomime older sisters I guess. I’m sure despite her sister’s efforts Meghan only becomes more popular as a result. Perhaps also giving William and Harry some perspective with their alleged feud. This is a blood feud which they will take to their graves. I’ve noticed the sneer on Samantha’s face – pure trash. I usually only shake my head with these outbursts; my half-sister is notorious for the hate-fueled outbursts. Agreed – she should thank what few good starry alighnments she has and get on with her life.